Greetings again from the darkness. It’s been more than 50 years since this one was released, so it seems a good time to offer up some thoughts and observations. Let’s start with the fact that you probably read Edgar Allen Poe’s poem “The Raven” in high school. 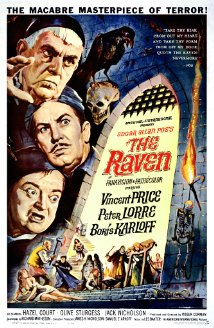 Director Roger Corman and writer Richard Matheson take Poe’s work as a starting point in a most unique story of their own. If you aren’t familiar with Roger Corman, he is one of the most prolific and entertaining “B” movie makers of all time. His writer here, Mr. Matheson, is best known for his work on numerous episodes of “The Twilight Zone“. Poe – Matheson – Corman would be enough, but we also get Vincent Price, Peter Lorre, Boris Karloff, Hazel Court and a young and not yet well known Jack Nicholson. Price is always a treat to watch (especially in horror films), Lorre appeared in 3 of the greatest movies of all-time (M, The Maltese Falcon, Casablanca), Karloff is the master of monster (and much more), Ms Court was one of the first stars of Hammer Films, and of course, Nicholson (fresh-faced here) went on to become one of the most successful actors in movie history. Price, Karloff, Lorre and Nicholson offer up four of the most unique and recognizable voices ever heard in movies, and they each partake in the fun provided by Corman here. Yes, I said fun. 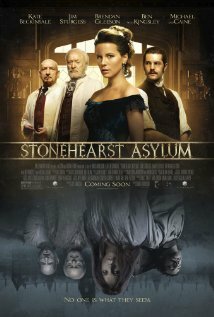 This is almost slapstick comedy, and at a minimum, it’s a parody of the much darker series of Poe films. If you consider it as an influence of the 1960’s “Batman” TV series, you wouldn’t be wrong. Even the music (heavy on the tuba) has an air of comedy. Watching Peter Lorre as a matador is pretty funny, as is Nicholson as the frenetic stagecoach driver. Some of the back-and-forth with Lorre and Nicholson as father and son is clearly ad-libbed, but the classic comedic sequence occurs when Price and Karloff take their wizardry duel to the death and turn it into a special effects highlight reel. This may be the only time you hear the phrase “precious viper” used to describe a woman, and if that, combined with all of the above reasons, isn’t enough to motivate you to seek this one out, then maybe you will never discover why so many adore the films of Roger Corman. Compared with films of today, this style is nevermore.